So I’m very fortunate that my daughter is growing up in a bilingual environment. My husband and I are both first generation Greeks. We try to speak in the Greek language as much as we can but also are aware of the fact that we live in an English speaking country. At the beginning I was only speaking Greek to her but when I realized that perhaps she was behind her ‘friends’ with certain words I kicked it into gear with the English. Regardless of this I’m amazed at what sponges these kids are. Every morning when I go in to get the kid I say to her Καλημέρα αγάπη μου (Good morning my love). Sometimes she laughs at me, sometimes she says hi mama, sometimes she just asks for daddy, it depends on her mood. Regardless that is my go-to greeting. This morning as we were sitting there she looks up at me and says τι κάνεις μαμά (how are you mom/what are you doing mom). I replied that I was καλά (or good). If you are fortunate enough to speak a second language or a third language speak to your children in it. If you have the opportunity to send them to learn another language do it! Now is the time for these kids to pick up on the little nuances of the particular language. My goal was to have my child speak Greek as well as I do, if not better and without the accent of an Αμερικανακή, I’m proud to say we’re well on our way! So I wish someone filled me in that when you turn two years old become fearless. It amazes me to watch my child and her friends attempt things that I would never do. Certainly I don’t think I did, I’ll have to ask my mom next time I see her, but to attempt it now would be crazy since I know I’d get hurt. As a parent you have to try to push those fears aside and let these kids explore. They need to experience first hand, they need to fall and push boundaries. With the wake of everything happening in the world, I’m assuming it is human nature to want to surround your little ones in a bubble and not let them out of your sight but yet that is so unrealistic. We must be able to help provide them with a safe environment to learn, grow and evolve. We must remind ourselves that this fall and accompanying bruise will be the first of many throughout their lives. We must remember that our job is to wipe away their tears and remind them that everything will be okay. To kiss the boo-boo and put a colourful band-aid on it but to them make them go back out and do the same thing again. We can’t let them be scared to do it again. Next time they’ll be more cautious and will succeed. So to all my fellow parents, please make sure you gently nudge your children to be fearless. Make sure we’re creating a generation of children who won’t be afraid to handle anything that comes their way in the future. One of the joys of being a transplant is you get to celebrate all the holiday! We just celebrated Canada on Friday and now we’re fortunate enough to celebrate the 4th of July today. We’re even more fortunate to have family with us today as we celebrate. Happy Birthday Canada!! 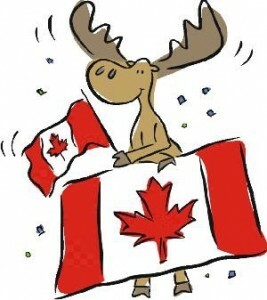 Wishing everyone a Happy Canada Day! Enjoy the weekend with your family and friends and be safe everyone!